Nataraja is called “one of the most popular forms of the god Shiva” by the great scholar of South Indian art and architecture, Dr. Douglas Barrett . Following his and other scholars’ work, many authors support the idea that the Dancing Shiva as Nataraja was a tenth century innovation by Chola artists and architects. A novelty possibly initiated or directed by the Chola queen Sembyan Mahadevi. It has also been suggested by some authors that this development was related to certain political objectives of the Chola dynasty, especially its imperial and expansive ambitions. Academic consensus follows the concept of a gradual evolution as proposed by Dr. Barrett on the basis of his work on South India art and architecture. It has been suggested Sembyan Mahadevi, a Chola queen who lived in the latter half of the 10th century, was responsible or at least somehow involved with this development . The absence of the goddess Ganga in the hair of all three Natarajas and the presence of Apasmara only in the last sculpture gives rise to the supposed evolution of the iconography of the Nataraja concept in the 10th century. According to this proposed concept of evolution lager sized Nataraja murtis were given a place of honor in a niche on the ardhamandapa wall only at a much later time. Dr Barrett describes this development and points out as the three earliest occurrences . 969-976 Konerirajapuram, Umamahesvara temple, (Sembyam Mahadevi); east devakoshtha of the south wall of the ardhamandapa. 979 (in or just before) Anangur, Agastyesvara temple, (Sembyam Mahadevi); west devakoshtha of the south wall of the ardhmandapa. 980 Tirukkodikaval, Tirukkotisvara temple, (Sembyam Mahadevi); east devakoshtha on the south wall. This academic analysis and understanding of the history of the Dancing Shiva reflects directly on the history of the Shri Nataraja temple of Chidambaram, of whom one of the authors of this article is a trustee and priest. To the authors of this article this concept is not fitting view of what they know and understand about the temple’s tradition. Relevant new evidence is always bound to change our view and perception. In the last two decades of the 20th century this concept of gradual evolution of the iconography and importance of the Nataraja under the Cholas of the second half of the tenth century has been revolutionized by the work of two remarkable scholars, Dr.Sharada Srinivasan  and Dr.Gerda Hoekveld Meijer . Through metallurgical analysis Dr.Srinivasan has laid the foundation for a factual approach to the attribution and dating of South Indian bronzes. By far the most significant conclusion of her work is the attribution of two Natarajas to the time of the Pallava dynasty, one with a date of around the year 800, the other with a date of approximately 850 . Dr.Hoekveld Meijer’s statistical and geographical analysis of the development of the structural features of Early Chola temples offers us new insights into the evolution of temple architecture under the Chola dynasty . The work of these two scholars encouraged and inspired us to pursue further research into the historical background of the Nataraja. The information generated by their research and the conclusions drawn from that triggered our attention and directed us to a reappraisal of the value of evidence that had been with us for two decades, but the meaning of which became only evident in the light of their work. Some time ago we took several photos in the Shri Nageshvara temple in Kumbakonam. One miniature presents us with a perfect example of the Nataraja. A return to the Nageshvara temple uncovered further material in support of an alternative and fresh understanding of the history of Shiva as Dancing Lord. Building on the foundations laid by Dr.Hoekveld and Dr.Srinivasan this (partly) recently discovered evidence offers a new view of the history of the Nataraja in general, as well as of his temple in Chidambaram and other aspects of South Indian history. The Sri Nageshvara temple of Kumbakonam is considered one of the great treasures of early Chola architecture and art. Dr.Hoekveld-Meijer in her detailed and comprehensive analysis of the evolution of the architecture of Early Chola temples dates it to the reign of Aditya Chola around the year 886. According to her this temple belongs structurally and stylistically to what she calls the Sapta Sthana group of temples, all built between approximately the year 870 and 895 . S.R.Balasubrahmanyam dates the Nageshvara to 885 , whereas Dr.Barrett dates it to 910 and the reign of Parantaka I . On the north face of the vimana of the Nageshvara temple, above and partly behind the Brahma murti placed on the kapota of the second tala, in front of the griva or neck of the shikara, we find within a large kudu a representation of the Dancing Shiva Nataraja. Because the sculpture is partly hidden and also very high up on the shikara not all the details are obvious to the eye. But the four armed figure and the raised leg can be clearly seen, as well as the presence of his consort on his (proper) left side. Also the prabha can be vaguely seen. The presence of Apasmara could not be established from a position in the courtyard of the temple. As at present the upper part of the vimana is covered with lime work and paint, it could be argued the presence of this Nataraja is a modern addition. But a photo from the archives of the British Library taken in 1892 by Alexander Rea , where we can see the vimana in its pristine original shape, shows this small Nataraja as a sculpture that is possibly almost completely in the round and showing all the familiar iconographical features that constitute the Shiva as Nataraja. The presence of the Apasmara can be inferred from the height of the murti relative to his surroundings. The presence of the second Nataraja in this compound clearly dancing on a crouching figure makes this supposition reasonable. As far as could be established the presence of this Nataraja sculpture in this temple has so far gone completely unnoticed. Besides this newly discovered early Nataraja sculpture this temple compound offers the student of South Indian art and architecture another treasure. One feature of this treasure has been noticed and reported on briefly by Dr. Barrett, but this observation has somehow slipped into oblivion. In the north-east corner of the temple courtyard we find a small shrine dedicated to Surya, the Sun. This shrine is an ekatala building facing west, with one devakoshtha niche in each of the walls of the garbha griha and ardhamandapa. Images of Surya are placed in the three niches of the sanctum. A murti of Ganesha is found in the South niche of the ardhamandapa, and a figure holding a flower in his right hand and his left hand on his hip is found in the northern ardhamandapa niche. This could be Chandra, the Moon. The figure has a similar round ‘halo’ behind his head as the three Surya murtis. Dr.K.A.Nilakantha Shastri considers this shrine contemporary with the main shrine. “…a Surya shrine in the n.-e. corner … seem to be the only survivals of the original parivara shrines.” . Dr.Barrett on his part concludes this shrine was constructed some time after the main temple . He observes: “The rectangular blocks of the wall-kantha are carved with miniature reliefs, one of which shows a Nataraja in ananda-tandava on a dwarf, a feature of some interest to students of Early Cola bronzes.”  Having drawn our attention to this Nataraja, he does not mention it in his recapitulation of early depictions of Nataraja in his lecture in honor of Sir Mortimer Wheeler in 1976 . And his observation has not had an impact on subsequent research, as far as could be established. Although this Nataraja is small, somewhat damaged, and has been repeatedly painted over with lime, it is clearly a Dancing Shiva in the ananda tandava pose. The Lord dances on Apasmara, holds drum and fire in his upper hands, and offers protection with the abhaya hasta and release with the dola hasta pointing at his raised left foot. On his proper left side is a kneeling figure that may be performing the tala or rhythmical accompaniment with cymbals. Shiva wears the crown-like fan of konrai flowers in his hair. This Nataraja can with good arguments also be dated to around the year 886 and the reign of the Chola Aditya I. The Nataraja on the Surya temple was observed by Dr. Barrett, but this small shrine for the Sun offers more artistic and iconographical treasure. It presents an extensive sculptural plan almost completely, it seems, dedicated to dancing forms of Shiva. And on top of the several miniature depictions of various tandavas it also presents a few panels whose content supports the significance. These miniature panels are carved on the base of the pilasters and on the kantha of the adhisthana. All the reliefs are situated on the grabhagriha walls. Not every place that could have a relief has been used, and some are too damaged to interpret. When we follow the direction of pradakshina, circumambulation, we first find on the north wall this Tripurasamhara Murti, Shiva as Destroyer of the Three Cities, accompanied by his consort, on a pilaster-base. Holding the long-bow with his right hand, his left on his hip, he is two-armed. His right foot is probably placed on the head of Apasmara, as can be inferred from other depictions of this type. Devi is turned away with bashfulness. Next is a four-armed, male, dancing Shiva, also on a pilaster-base. The position of the legs may be compared with a Nataraja from the Bhoganandishvara temple in Nandi in Andhra Pradesh, which is identified as a Choa temple from the 10th century . Around the corner, on the East wall, we find a four or six -armed Natesha on the right corner pilaster. This sculpture is similar to a Natesha from the Kuranganatha temple in Srinivasanallur . A totally different theme from all the other miniatures is found on the base of the right hand pilaster of the niche projection of the east wall. It is a scene involving a large number of tiny human figures, and we cannot at this point make a positive identification. A Tripurasamhara with four or six arms, this time without his consort, but with a clear depiction of his chariot, and represented at the moment of shooting his arrow, on the base of the half-pilaster that frames the niche. The third pilaster presents us with the Nataraja. Apasmara lies prostrate facing left. 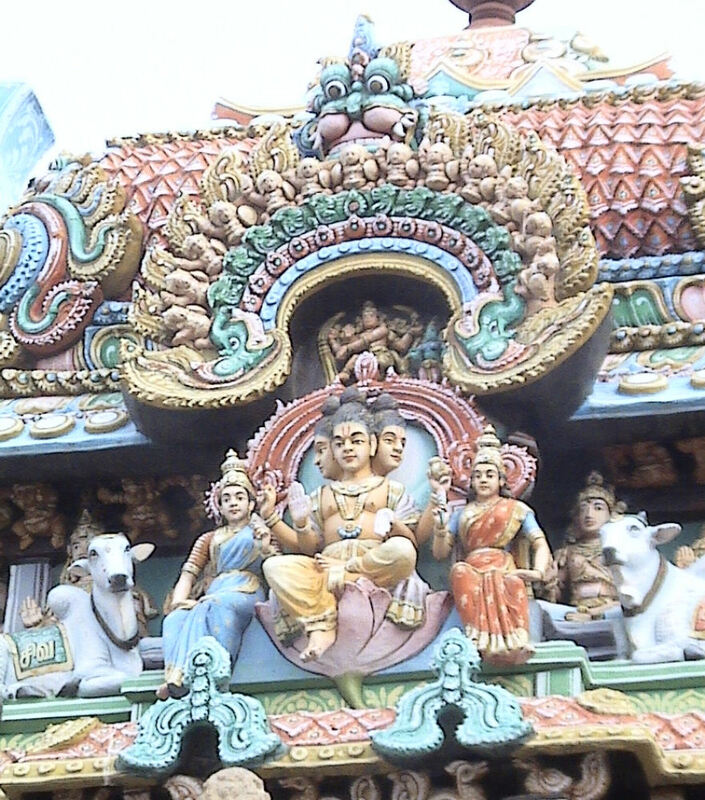 The figure to the right lifts his arm to beat the tala, as Devi is said to do in accompaniment of Shiva’s dance in Kumbakonam. Although the attributes are not clear, the position of the arms indicates the damaru (upper right), the fire (upper left), dispelling fear (lower right), and offering grace (lower left). On the kantha under the corner pilaster, on the south wall, we find a depiction of Gajasamhara, Shiva as the destroyer of the Elephant demon, dancing on his skull. The Lord dances in the pose peculiar for the depiction of this tandava in South India, with one leg lifted high above the hip, torso twisted around. Except here he faces right instead of left. He has eight arms. On the kantha of the two pilasters that frame the niche we also find reliefs. Only one shows a clear image, of a male figure leaning back on an arm support. We have no positive identification of this figure at this point. On the base of the corner pilaster on the left we find another Gajasamharamurti. With his eight arms he holds up the elephant skin and dances with his left leg lifted up above the hip and his left foot pressing the elephant skull. This pose is typical for Pallava depictions of the tandava . This relief, on the kantha of the corner pilaster of the sanctum, under the Gajasamharamurti is of the Purushamriga. This mythological creature with the body of a lion and the face (and in this case also the upper body) of a human being is the Indian equivalent of the sphinx. The Purushamriga is known in the mythology as a staunch Shiva bhakta. Here depicted worshipping with a lamp and a bell, an image well known from iconography . The presence of this shrine for Surya with a sculptural plan almost entirely dedicated to dancing forms of Shiva may seem puzzling. But it becomes clearer when seen in the light of further information from the tradition and literature. One Tevaram hymn composed by saint Appar in the 7th century is dedicated to this temple and every verse addresses Shiva as Kuttanar, or Dancing Lord, the god of Kutantaik Kilkkottam, which is the ancient name for the Nageshvara temple in Kumbakonam . Another hymn, this time dedicated to the temple of Chidambaram, describes various places where Shiva is also dancing. This hymn mentions “He is in Kutamukku”, another ancient name for Kumbakonam . Appar describes ‘Kuttanar’ as fiery red, wearing the flooding Ganga and the crescent moon, konrai flowers and a cobra in his hair. And as wearing the tiger skin and the sacred white thread. The poet places the Dancing Lord in the geographical and mythological environment of ancient Kumbakonam: mentioned are several of the sthalas nearby that are connected to the mythology and spiritual geography of Kumbakonam: Pukalur, Purampayam, Punturutti, Palanam, Neytanam, Corruturai. Also enumerated are the rivers that gather in the Mahamagha Tirtha on the occasion of the Mahamagha festival, which is celebrated once in twelve years , and several other mythological events connected with Kumbakonam. The dance is said as having stirred up the water of the ocean that “rose so high as to strike against the top of the universe” . In the sthala purana of Kumbakonam we find narrated how Shiva came to dance in Tiru-kilk-kottam, the Nageshvara temple . After the destruction of Daksha’s yajña Devi was reborn as Parvati, daughter of Parvata Raja, and married Shiva once more. Parvati prayed never to be separate from Shiva again and became established in his left side. Thus Shiva gave darshan to the Devas as Ardhanarisvara. Subsequently from the prayer of the Devas Subrahmanyam was born, who destroyed the demon Surapadma and released the Devas from his oppression. Further the Devas prayed to have darshan of the Lord’s dance. Shiva told them to go to Kumbakonam, bathe in the river Kaveri, worship Kumbeshvara and all other deities and assemble before the sanctum of the Nageshvara temple. Residing on the Divya Vimanam Shiva and Parvati flew from Kailasa to the Vilva forest of the Nageshvara temple in Kudandai (Kumbakonam). There the Vimana came to rest and changed into a Chit Sabha. Then, with Parvati playing cymbals, Ganapati drum, Visnu on the flute, and Tumburu and Narada singing, Shiva danced the Jñana Nritta. Damaru in one hand, fire in the other; with dola hasta and abhaya hasta; adorned with a skull mala and with the fragrance of konrai flowers spreading everywhere; his matted hair straightened; crescent Moon and the torrential Ganga adorned on his head; wearing the tiger skin around his waist; one foot stable, pressing the Muyalakan’s back; his lifted foot ‘kuncitapada’. Thus he gave darshan to the Devas and all. As the Devas rejoiced and experienced his radiance, they prayed he should dance in this sacred place permanently. The Lord granted their wish. Although these traditions do not figure prominently in the present day perception of the temple, it is a fact that two shrines within the complex are dedicated to dancing forms of Shiva. A beautiful ratha or chariot type shrine houses a Nataraja Murti together with his consort. Opposite this shrine is another in which resides an Urdhva Tandava Murti, Shiva dancing with his leg raised up to the sky. This is the dance with which Shiva defeated the goddess Kali in the mythological dance contest. Balasubrahmanyam dated the Nageshvara temple to 885 on the basis of inscriptural evidence. Hoekveld-Meijer to 886 on the basis of her statistical analysis of the structural elements. This would mean this temple was built under the Chola king Aditya I. Barrett concludes this temple was built in 910 during the reign of Parantaka I. But Dr.Hoekveld’s structural analysis has generated very different conclusions concerning the chronology of temple building under the Cholas from that proposed by her predecessors. The chronology proposed by Barrett for the four Early Chola depictions of the Nataraja is revolutionized by her as shown by the following table. With the temple in Tiruchchennampundi  and the temple in Teruverumbur dated to just before and contemporary with the Nageshvara by Dr.Hoekveld-Meijer it becomes clear that depictions of Nataraja were already common in the late 9th century under the reign of Aditya I. From Dr.Srinivasan’s metallurgical analysis we also know Shiva was already depicted in bronze as Nataraja under the Pallavas, also in the 9th century. The worship of Shiva in this form was evidently much more ancient and wide spread than has been recognized thus far. This evidence makes speculations about a Nataraja Dancing Shiva ‘designed’ with political motivation projected on the Cholas of the later part of the 10th century and connected with the worship of Nataraja in Chidambaram irrelevant, we could say. 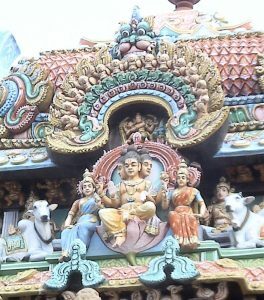 The Tevaram and the stala purana offer us ample reasons and background for the depiction of Shiva as Nataraja in the Nageshvara temple in Kumbakonam. This same evidence also shows that the Dancing Shiva Nataraja of Kumbakonam and the Dancing Shiva Nataraja of Chidambaram were iconographically very similar. The literary and sculptural evidence enriches and deepens our understanding of the development and evolution of worship of Shiva as Nataraja in South India. This leaves us with the following conclusions. The metallurgical evidence generated by the research of Dr.Sharada Srinivasan in combination with the structural analysis of Dr.Hoekveld-Meijer supports the sculptural and literary evidence presented in this article. The Nataraja iconographically identical to the Dancing Shiva of Chidambaram is depicted four times on at least three temples constructed between the years 880 and 890. We now also have become aware of the fact that the worship of this form of Dancing Shiva was also indigenous to the spiritual traditions of Kumbakonam from a very early time onwards. Barrett, D. The Dancing Shiva in Early South Indian Art, in Proceedings of the British Academy, 1976, p. 327-336. Dehejia, V. Art of the Imperial Cholas. New York: Columbia University Press. 1990. Barrett, Dr. D. The Dancing Shiva in Early South Indian Art. in Proceedings of the British Academy, 62, 1976, p. 331-332. Barrett, Dr. D., The Dancing Shiva in Early South Indian Art, in Proceedings of the British Academy, 62, p. 332. Srinivasan, S. 1996. The enigma of the dancing ‘pancha-loha’ (five-metalled) icons: archaeometallurgical and art historical investigations of south Indian bronzes. PhD thesis. Institute of Archaeology, University of London. Hoekveld-Meijer, G. Koyils in the Colamandalam. Typology and Development of Early Cola temples. PhD thesis, Vrije Universiteit van Amsterdam, 1981. Srinivasan, Dr.S. Shiva as ‘cosmic dancer’: on Pallava origins for the Nataraja bronze, in World Archaeology, 36(3), 2004, p. 432-450. Nilakantha Sastri K.A., University of Madras, Madras 1984, p. 703. Sivaramamurti, C. Nataraja in Art, Thought and Literature, New Delhi 1974, p.214, fig. 76. Gaston, A., Siva in Dance, Myth and Iconography, Oxford 1982, p. 103, Plate 50. Gaston, A., Siva in Dance, Myth and Iconography, Oxford 1982, p. 158, Plate 83. For further information on the Purusamriga I refer to my website www.sphinxofindia.rajadeekshithar.com and to the article Discovering the Anthropomorphic Lion in Indian Art in Marg, 2004, number 4, June 2004, p. 34- 41. Digital Tevaram, Institute Francais de Pondicherry and Ecole francaise d’Extreme-Orient, 2007, Collection Indology 103. Appar Tevaram patikam 6.75. Digital Tevaram, Institute Francais de Pondicherry and Ecole francaise d’Extreme-Orient, 2007, Collection Indology 103. Appar Tevaram patikam 6.2. Once in twelve years when the Sun is in Aquarius and the Moon and Jupiter in Leo a great festival is celebrated in Kumbakonam. Pillai, Minattisundaram, Kumpakona Stalapurana Vacanam, 1933, p.30-34. It may be noted in this context that the Shiva in the temple in Tiruchchennampundi is called Sadaiyar. This name refers to Shiva’s matted hair and almost always denotes the Nataraja.